(read A / B as "A over B"). 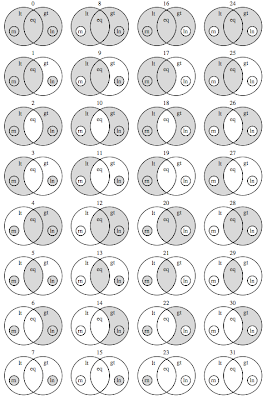 All three sets are pairwise disjoint, since A / B ⊆ A and A / B ∩ B = ∅, and conversely, by construction. 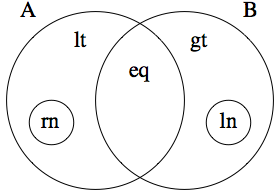 Arguably, besides the traditional five set operations A ∪ B, A ∩ B, A − B, B − A and A ∆ B, only the remainders A / B, B / A and perhaps A / B ∪ B / A = A ⊔ B, the join of A and B (not to be confused with the relational operation), are independently useful. These three are obscure, and as far as I know have no name, although I'd love to hear if there is literature about them. 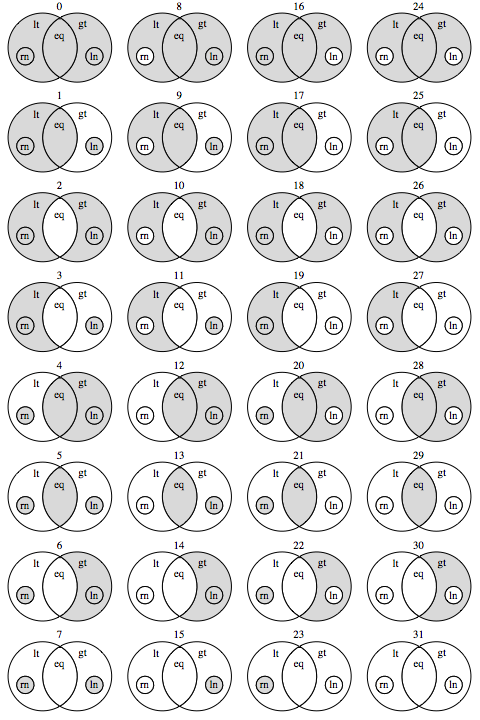 This might mean that this exhaustive catalog of set merges is rather pointless, but at least now I know for sure. Interesting observation! I like such simple and clear structures which is easy to observe when using functional style and which is not so noticeable when using java or c. I'm your reader now! To the extent possible under law, Matías Giovannini waives all copyright and related or neighboring rights to the source code expressed on this blog. The author asserts his Copyright © 2007–2012 and retains and reserves all rights to the texts and images on this blog which are not otherwise generated by the waived code. This work is published from Argentina.